"Lies, Fake News, and the Main Stream Media," the cover story of the latest issue of ColdType, unfortunately also applies to the state of science reporting as evidenced by main stream coverage of the recent Royal Society public evolution conference. I spent much of the last two years investigating and reporting on an evolution paradigm shift that has happened in science -- whether the science establishment and main stream media acknowledge that shift or not. And having just published an authentic report of the Royal Society "new trends" meeting, I cringed as I read Carl Zimmer's distorted coverage that followed of that same event in Quanta and TheAtlantic.com. Carl Zimmer is not a scientist. He's a Yalie with a degree in English, best known as a science writer for the New York Times ("all the news that's fit to print"), although his business card presents him as a national correspondent for STAT. Quanta's Editor, Thomas Lin, is a former NYT online national news and science editor. I had been feeding Thomas Lin and Quanta my HuffPost reports in the lead-up to the November 7-9 Royal Society/British Academy-sponsored meeting. And, prior to the London meeting, I sent a copy of my book, Royal Society: The Public Evolution Summit to James Simons, whose Simons Foundation funds Quanta. I interviewed Jim Simons at length two years ago for my book on origin of life. So far, curiously, Zimmer seems to be the sole representative of the main stream media to have reported on the Royal Society conference. I'd like to preface that by saying that my own career began at Hearst Magazines, where I wrote an environment column in the early 1970s that circulated to 1.5 million people worldwide (half of my undergrad years were in biology). And during the golden age of journalism I wrote for some of the finest publications -- like "the old Economist magazine" and the Financial Times. I was a contributor to probably the most successful popular science magazine ever -- Omni -- a publication Lynn Margulis relied on to introduce her ideas to the public. I traveled extensively for Omni, interviewed Mary Leakey at Olduvai, etc. . . .
On a break from one of the Royal Society "new trends" lectures I ran into the photographer Quanta hired to shoot the event and gave him a copy of my Royal Society book. He told me he was working with Carl Zimmer. I then bumped into Zimmer outside the Royal Society conference room in between sessions, introduced myself and commented that there should have been a greater diversity of evolutionary perspectives presenting at the meeting. I expected Zimmer to be somewhat in agreement. After all, this was not a meeting of the X Club in 19th century England. A clique of scientists clearly cannot dictate science anymore. Science has been democratized via the Internet, and the online news cycle is 24/7. But Zimmer's response to me was: "It's not that kind of conference." I gave Carl Zimmer a copy of my Royal Society book as well. We've had no further dialogue. Zimmer neither reported on Altenberg! eight years ago -- where the question about an extended synthesis was first raised -- nor has he been covering the discourse since regarding paradigm shift. So in his piece for Quanta, he took a gee-whiz approach to themes like plasticity, epigenetics and niche construction, themes that have been kicking around for a long time and are clearly not cutting-edge science. He used terms like gene and natural selection in his story without ever defining them -- except to say with a straight face that "natural selection is an important force in evolution." Zimmer appears not to have heard presenter John Dupré's response to my request for a definition of what a gene is. Dupré replied, there is none. Remember Zimmer is a journalist who got his start at Discover magazine in the late 80s, he's not a scientist who can speak from authority. Yet he throws around "Extended Evolutionary Synthesis" in his account of the meeting without acknowledging that there is no agreement by the scientists who are participating in the Templeton EES project on what the word "extended" means. "Eight years after Altenberg, the meaning of the word "extend" is on the table with scientists now quibbling over whether "extend" means (1) amending the standard theory of evolution, (2) a parallel theory of evolution, or (3) a replacement of the Modern Synthesis/neo-Darwinism." Then there's the question of what life is. Zimmer never goes there. . .
Zimmer decided to skip any mention of Sir Pat Bateson cautioning about overuse of the "metaphor" of natural selection and saying further that "natural selection is not an agent." Bateson was one of the organizers of the November meeting. He was knighted in 2003 by Queen Elizabeth for his service to biology. He's a zoologist, a member of the Royal Society, as well as former RS Vice President and Biological Secretary -- among other distinctions. In reading the Quanta article, I also wondered how Zimmer could have missed Richard's Lewontin's 2009 cover story for New York Review of Books: "Not So Natural Selection" in which Lewontin also described natural selection as a metaphor and said Darwin never intended it to be used literally by generations of scientists. As noted above, in 2014 I did a feature-length interview for my book on origin of life with Jim Simons, and with several scientists from the Simons Foundation's team investigating origin of life -- including Jack Szostak, Dimitar Sasselov and Matthew Powner. Simons is one of the most intelligent and generous people on the planet, but he doesn't like to interfere with the operations of the philanthropic activities he funds. Indeed, Quanta considers itself, "an editorially independent division of SimonsFoundation.org." So the reporting of the Royal Society story was clearly not Jim Simons' fault. TheAtlantic.com should have known better, however. In 2009 I infiltrated the launch party for Atlantic Wire -- the online op-ed aggregator of the magazine -- carrying a copy of my book, The Altenberg 16: An Exposé of the Evolution Industry. The moment was captured here by one of Patrick McMullan's photographers. The Atlantic magazine's Editor, Scott Stossel was at the party. So I took the opportunity to share with Stossel the reprint in my book of his rejection letter for my evolution pitch. Stossel was amused and asked for a copy of the book, which I later sent him. Thanks for your call, and for this pitch. It's a good idea for a story but, as I should have mentioned yesterday, we've actually got a Darwin piece in the works already. It's much smaller in ambition than yours, but I'm afraid it crowds out the possibility of our assigning another one. So we'll have to pass. But I wish you luck in placing this elsewhere. Best, Scott"
"While I much enjoy his [Zimmer's] writings (articles in NY Times and National Geographic, and book) I have long considered him a solid, non-imaginative, non-visionary conformist of Darwinism (or Adaptationism) who mostly just regurgitates the concepts of the Modern Synthesis in elegant and pedagogically useful prose - notably when reporting on new findings that fit the Darwinian orthodoxy. . . ."
"The description of the discussion of my talk at the RS-BA meeting is seriously incorrect. The central point of my lecture was that organisms harness stochastic mutations in variable locations in their genomes to generate functionality. I gave clear examples of this in the immune system and in bacteria where such targeted functional stochasticity is common. The questioner could not have been listening to my lecture. To quote my abstract "Stochasticity at low levels does not therefore exclude order at higher levels. Organisms enlist stochasticity in their development of functional behaviour."" Astonishingly, Zimmer gives almost a page to an archaeologist's comments on natural selection and the "revelation" of niche construction. Yet Zimmer avoids any mention that presenters were seriously deficient in their understanding of viruses and microbes. It is absurd for scientists who are ignorant about the role of viruses and microbes in evolution to think that they can design a new evolutionary synthesis by cozying up to Templeton Big Bucks and then get the main stream media to force feed their brand. DO THEY ACTUALLY EXPECT US TO SWALLOW THIS? Ten of the presenters at the meeting were part of the Templeton Extended Evolutionary Synthesis project. Templeton is providing $11M in funding to 50 EES institutional scientists. As the late science historian David F. Noble once warned: "When you have a consensus of scientists, that should set off alarms." It is wrong of Templeton to try to impose this kind of mediocre science on the public. What's more, it is contrary to its "spiritual" mission. 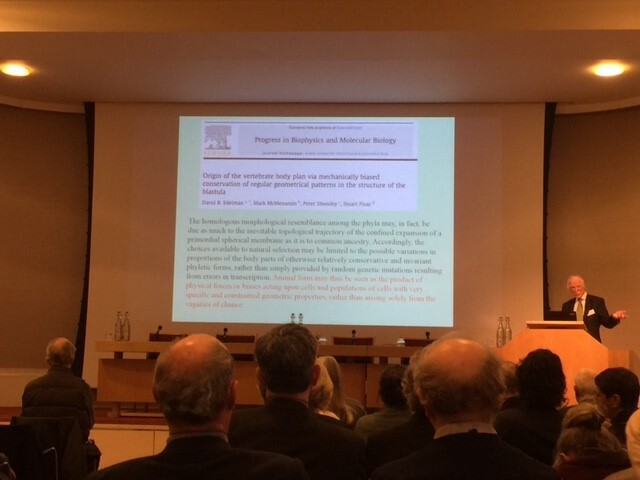 In reality, the only stir at the Royal Society conference happened when Denis Noble highlighted the embryo geometry paper of Stuart Pivar et al. And even that had been recently published online in Biophysics, the journal Noble co-edits. Pivar had for years been shut out by the science establishment. Curiously, one of the scientists whose work Zimmer praised in his Quanta story, sent me an email accusing me of being a sexist because I did not report her ideas in my account of the event. I wondered if she'd ever seen my interviews with and stories about Lynn Margulis, Mae-Wan Ho, and Sara Walker. I did send her a copy of my Royal Society book prior to the meeting. For the record, in between covering the wars (Gulf War, Colombian Drug War, Sudan and Kashmir (from both sides of the conflict)) and then the science wars (beginning in 2008) -- I wrote a series of exposés on polygamy for the Financial Times -- the paper gave me page 1 of the weekend edition for one of those stories. I was part of Bella Abzug's Women's Foreign Policy Council in the late 1980s and before that chaired the first major benefit for battered women in Manhattan (1985) -- which then Governor Mario Cuomo and his family supported and which helped lead the way for domestic violence legislation in New York. The impetus for the event was that the Reagan Administration had cut funding for battered women's shelters. An interesting aside is that I approached Donald Trump shortly before that 1985 benefit, at a Democratic party fundraiser at Central Park's Tavern on the Green and asked if he'd buy a couple of tickets ($100@) to the benefit. Trump said, sure, send them to my office, and advised who to direct them to. Trump then looked at me and my co-chair of the event and said: "Well, you girls don't look like you've been through it." End of story? -- our President-Elect never bought the tickets.